It’s that time of year where sports start to dominate this blog. Last week, we went to Ajinomoto Stadium to enjoy a little football. This week, we head to Meiji Jingu Stadium to enjoy America’s favourite pastime. I have often felt that the Japanese take on baseball is much better than the American version. Drinks are flowing readily for the entire game and you don’t have to leave your seats if you don’t want to. While it may be difficult to get food in the stands, relative to American baseball games, you can still get many things without moving in Japan. This year, I only have one real opportunity to see my favourite baseball team play. I am a fan of the Hanshin Tigers, whose home stadium is located between Kobe and Osaka. I love to visit Meiji Jingu Stadium because it is the only open top baseball stadium in central Tokyo and I love the fans there. It is common to see a few familiar faces and I was happy to see the same familiar faces there. Being the 5th time that I have watched this match in Tokyo, there really isn’t too much to cover, so I’ll keep it a little brief compared to my previous posts. If you want to read about what you need to do and prepare for the games, check out the links at the end of this post. Initially, I had intended to go to Meiji Jingu Stadium to watch the Hanshin Tigers face the Yakult Swallows on July 24th. Unfortunately, it was raining lightly all day so I decided to wait a day and watch the game on July 25th. For this short series, there were only 2 back to back games at Meiji Jingu, even though there are usually 3-4 games in a row. It would have been perfect to visit on the 24th as I had no major plans for that day and I could have gotten there early. It would have been even better because the Tigers won their game 12-0. 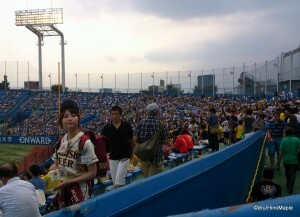 On the 25th, I was pretty busy and I couldn’t get to Meiji Jingu Stadium until 5:30, about 30 minutes before the game. I raced over there as fast as I could, including passing all of the slow walkers from the station. I got to my regular seating area and found all of the seats were gone. I always sit in the free seating area in the outfield, really close to the press section. I am usually almost under the scoreboard at centre field. If you know where to look, you can probably see me on TV from time to time. It is pretty far from the home plate but it is usually a good place to be as there are less people trying to get seats in that area. Usually the best seats go the second they open the gates as the diehard fans reserve entire rows for their friends and family, so I am usually left with whatever is left. I was very lucky in that I could find a couple seats in the same section but it wasn’t ideal as I was not near the aisle to get beer easily. It wasn’t bad as I was pretty close to a ramp to get into the seating area and I could get good videos of the different cheers and the crowds. 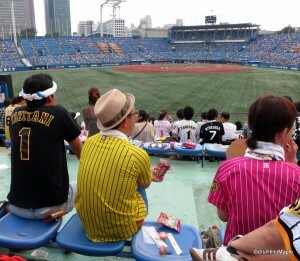 I was probably one of the last people to get a seat in the entire Hanshin Tiger’s side as later on in the game it was standing room only. I had another friend get in closer to 6pm and he had to go to the Yakult Swallows side; even though he wanted to cheer for the Tigers. Interestingly enough, he did get a photo of me, but it would be a little difficult to pick me out as I was the size of a pinhead in that photo. The game itself was a complete washout. In the first inning, the Tigers showed a lot of promise. There were a few good hits and the Tigers scored one run. The crowd was going crazy but things would not go so well from there. 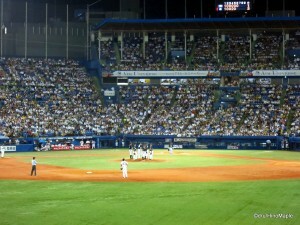 The Swallows were able to get a quick run in during the 1st and both teams had a quiet second and third inning. The 4th inning saw things get bad for the Tigers. The Swallows were getting good hits and the Tigers were making errors. The Swallows went up by 2 runs in the 4th and continued to score runs. The Tigers were held at just a single solitary run for the entire game and the game was stopped at the bottom of the 9th as the Swallows were guaranteed a win. 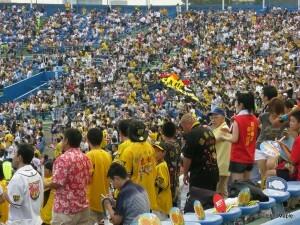 The Hanshin Tigers fans were pretty ruthless as always. At the top of the 7th, all of the fans went into the standard Rokko Oroshi song to proclaim their love of the Tigers and wishing them to turn things around. In the middle of the 7th, they typically stole the Yakult Swallows theme song and sang of the death of the Yomiuri Giants. I love the fact that they scream “Kutabare Yomiuri” which is basically wishing death upon the Yomiuri Giants. I even love the fact that the Tigers fans had their own yellow umbrellas to counter the blue and green plastic umbrellas of the Swallows. You can see it in the videos below. Around the 8th inning, you could see a lot of people starting to leave, even on the Tiger’s side. I was not willing to leave so I stayed until the bitter end. In the 8th inning, when the Swallows were scoring a lot of runs, the fans turned on the Tigers and started singing the Swallows theme song instead. I was a little sad to hear this but at the same time, it was revealing as to who the Tigers fans are. They are ruthless in telling the team how poorly they are doing and willing to leave them in order to show their disgust. I don’t agree with it, but that is how “bad” the Tigers fans are. It had been a very weird July in Japan with the threat of thundershowers constantly coming in the late afternoon for most of the month. The rainy season had officially been declared over by the Japan Meteorological Agency in early July, one of the earliest ends to the rainy season and yet the rain continued to fall but only in short spurts. It is making the summer seem as if it can’t decide if it is here or not. That is making going to the various sports events in Tokyo very difficult to do. It is getting difficult to know when I can or can’t go to a game but I am still trying to get to many games. I love to watch the games and you will still see me at the various games around Tokyo. While I may not be at Meiji Jingu Stadium again until next year, you’ll definitely see me at other sporting events around Tokyo. My heart will still be cheering for the Tigers and the death of the Giants, but being a big “casual” fan of the Tigers, my priorities are not in going to as many games as I can, but rather to just cheer from a distance. Perhaps you’ll see me at Tokyo Dome cheering on the Tigers in the near future, but we’ll have to wait and see. This entry was posted in Baseball and tagged baseball, Baseball in Japan, beer, Beer Girl, Beer Girls, Hanshin, Hanshin Tigers, japan, Japan Baseball, Japanese Baseball, Kutabare Yomiuri, Meiji Jingu, Meiji Jingu Stadium, Nippon League, Rokko Oroshi, Sport, Swallows, Tigers, Yakult, Yakult Swallows by Dru. Bookmark the permalink.